In anticipation for Star Wars VII, I still find the original trilogy most exciting and it will forever be part of my own childhood and our general culture. I’ve edited this list of 33 photos from behind the scenes, each from a unique angle. And each excites me every time. Some are rare. There’s a rare video with bloopers towards the end… And the last photo is my dream come true. Enjoy! 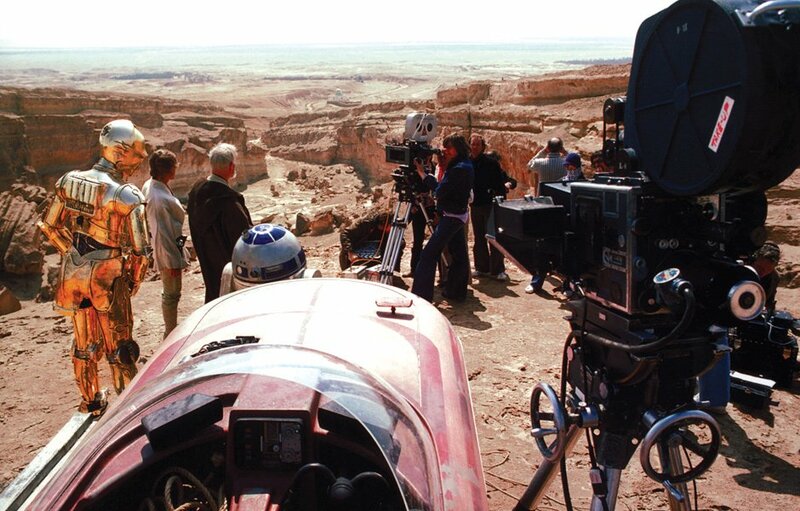 Star Wars Episode IV: A New Hope Shooting the first glimpse of Mos Eisley (“You’ll never find a more wretched hive of scum and villainy.”) in Tozeur, Tunisia. The production used porters and mules to carry equipment up a cliff, including a tea urn for the English crew members. By the time Anthony Daniels was fitted into his C-3P0 suit, it was tea-time and he spent the duration of the break locked inside his metal suit.